Before Bushwackers: an overgrown eyesore. 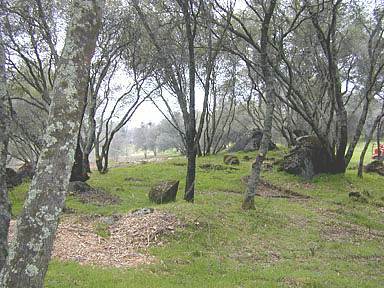 The goal for this 5-acre Placer County foothill property was to create a more marketable home site for our Investor client. Heavy vegetation blocked views and masked the gently sloping terrain, making it impossible to see the site's natural beauty and ideal building conditions. 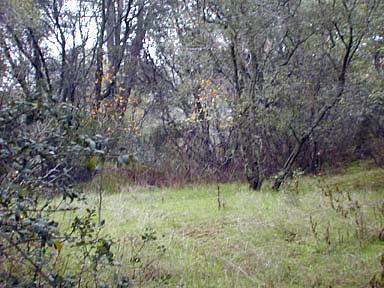 The brush was so thick in some areas that it completely concealed several dramatic boulder outcroppings. Poison oak overwhelmed much of the land, growing up 20 feet into the trees. Overly-dense tree growth hid view corridors and made it difficult to visualize possibilities for home placement. Masses of blackberries disguised a picturesque creek bed. These conditions demanded a variety of skill and equipment to deliver a setting that would have curb-appeal. Hand removal was required for the poison oak and dense brush thickets. Mastication took care of the blackberries. One of our tree experts trimmed and thinned out about 20% of the trees on the site. Our remote-control track-mounted chipper efficiently processed most of the vegetation into lush mulch, while the Mountain Goat chipper was a perfect match for the larger trees and gangly brush. The results were stunning - a property that would appear to have no redeeming qualities at first glance became a park-like retreat that proved to attract potential spec builders and homeowners alike. After Bushwackers: a park-like retreat!